The Oak Alley Plantation is a very popular location in the city of Vacherie, Louisiana. This structure has been said to be haunted by many who reside near to the location, individuals that work in and around the structure, as well as those that visit the building. This particular structure is so popular that it has been used in a variety of movies to enhance the plot. One of the most popular movies to feature this location was the movie called “Interview with a Vampire”. In this guide, you will learn about the haunted legends that surround the captivating Oak Alley Plantation. In the year of 1837 the Oak Alley Plantation was constructed by an individual who was named George Swainey. The family to move into the residence was construction was completed was one that an included a wealthy man by the name of Jacques Roman III. His wife, Josephine, joined him and helped to make the structure a comfortable home. 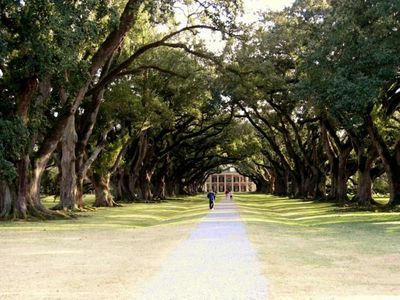 Prior to the building of the home, a great number of trees were planted in the front yard area of the structure and this earned the plantation the name of “Oak Alley”. Approximately ten years later, this owner passed away due to the fact that he had acquired the devastating condition of TB. By 1866, this property was placed up on an auction and several owners took possession of the property immediately following. A couple by the name of Josephine and Andrew Stewart eventually gained possession of the structure in the year of 1925. By this time, it had reached the point of despair. The couple worked diligently to restore it to its original splendor. Eventually, Josephine developed a foundation called the “Oak Valley Plantation”. In the year of 1972, she passed away and the foundation took over and gained control. By the time that 1998 came around, the beautifully restored building was opened as a bed and breakfast to guests traveling through the area, and locals that just wanted to escape for short periods of time. Individuals who work offering tours, cleaning services, and handling other responsibilities through the Oak Alley Plantation have claimed that there are many different unusual events that have occurred inside the structure, as well as around the structure. Many of these employees will refer to the plantation as the “Big House”. One of the most common haunted legends that many of them claim is that they hear the sounds of someone crying. The sound of crying appears to be either a woman, or a child, but the individuals who witness it are unable to distinguish which it is. Several individuals have claimed that they have seen an apparition that appears to be a female. This spirit appears to be quite slender and is said to have hair that is long and either dark brown in color, or possibly even black. In studying the history of the home, many of the employees and local historians state that this could be the lady, Josephine that originally lived in the home once it was constructed. There are many who are under the impression that it could also be Josephine’s daughter, Louise. If you visit the plantation, you will likely catch a glimpse of the apparition in the rooms, lingering in the widow’s walkway, or possibly even taking her phantom horse for a ride around the building! During the tours of the home, it is likely that you may catch some strange and unexplained phenomenon occurring. One example of this activity is objects that seem animate and that fly through the room. Many have even claimed to have seen a male apparition lingering in the area that is known to be the old kitchen of the structure. If you find yourself in the area of Vacherie, Louisiana, be certain the look for highway 18, which is also referred to as “Great River Road” and you will find the haunted Oak Alley Plantation at 3645. Stop by and see what you think – haunted or not? Feel the gentle breeze of Southern hospitality on a tour that takes you back to the glory of the Old South and visit to one of the most historic and beautiful homes in Louisiana, the Oak Alley Plantation.